When you or a family member takes a traumatic hit to the mouth, what should you do? Besides immediate first aid, your next action will depend on the extent of damage to any teeth. What you do and when you do it may even determine whether an injured tooth is eventually saved or lost. If a tooth has been completely knocked out, you have about five minutes to replace the tooth in the socket to give it the best chance of reattachment and long-term survival. While we can certainly perform this action in our office, getting to us within five minutes may not be possible. Fortunately, any person can perform this action on site (see the article linked below for basic instructions on replantation). If for some that's not possible, you should control bleeding at the tooth site with direct pressure, place the recovered tooth in milk or the patient's saliva, and see us as soon as possible. If, however, the injured tooth has been obviously knocked out of line but not completely detached from its socket, you have a small cushion of time to seek dental treatment — but not much. For this degree of injury, you should see us within six hours of the incident. We will be able to determine the exact nature of the injury, and treat the condition by moving the teeth back into proper position and splinting them. You have up to twelve hours for broken or chipped teeth still in their normal position. Try to locate and save any broken-off fragments — it may be possible to re-bond them to the teeth. Although it may not be as urgent as other situations, you should still seek treatment as soon as possible. 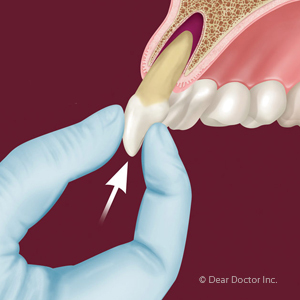 A broken tooth could leave the inner pulp exposed — a situation that left untreated could lead to eventual tooth loss. Traumatic injuries to the mouth can have serious consequences for your long-term dental health. With our consultation and treatment efforts, we can help you save an injured tooth. Research conducted by the American Dental Association (ADA) found that individuals are 60 times more likely to damage their teeth when not wearing a mouthguard while engaged in contact sports or rigorous physical exercise. This shocking fact alone illustrates the importance of protective mouthguards. A study reported by the American Academy of General Dentistry (AAGD) found that mouthguards prevent more than 200,000 injuries to the mouth and/or teeth each year. Sports-related injuries often end-up in the emergency room; however, the US Centers for Disease Control (CDC) reports that more than 600,000 of these visits involve injury or damage to the teeth and mouth. In addition to the trauma of having a tooth (or teeth) knocked out, individuals who have suffered from this type of injury may end up spending $10,000 to $20,000 per tooth over a lifetime for teeth that are not properly preserved and replanted. This staggering statistic is from the National Youth Sports Foundation for Safety. While protective mouthguards were first used in the sport of boxing during the 1920s, the ADA now recommends their use in 29 (and growing) different high contact sports and activities. Some of these include acrobatics, baseball, basketball, bicycling, field hockey, football, handball, ice hockey, lacrosse, martial arts, skateboarding, skiing, soccer, softball, volleyball and wrestling. It used to be that only males were considered when it came to needing mouthguards. However, recent studies have revealed that the growing interest and participation of females in these same sports and activities makes it just as important for them to protect their teeth. To learn more about the importance of mouthguards, continue reading the Dear Doctor magazine article “Athletic Mouthguards.” You can also contact us today to schedule an appointment or to discuss your questions about protecting your mouth and teeth. And if you have already suffered from a dental injury, let us evaluate the damage and work with you to restore the health and beauty of your teeth. People always wonder when it is appropriate to contact their dentist. To answer this, we have put together the following list to provide some guidelines for you and your family. However, your calls are always welcome! Our goal is simply to give you some clear scenarios that illustrate when you should give us a call or come in to our office. Early or late loss of baby teeth. Difficulty in chewing or biting. Finger sucking or other oral habits. Crowding, misplaced, crooked or even missing teeth. Jaws that shift, jaw joints that “pop” or “click” or are uncomfortable. Any change causing speech difficulty. Protruding teeth — large overbite. Teeth that meet in an abnormal way or don't meet at all. Grinding or clenching of teeth. Knocked out permanent tooth: Call us immediately. You need to take action within 5 minutes of the injury for best results. Injuries to lips, cheeks, tongue or gums that appear to require stitches: Call us for instructions as soon as possible. Tooth injury — if a tooth has shifted from its original position: Call us to tell us you are on your way to our office and see us within 6 hours of the injury. Chipped or broken tooth that is still in its original position: See us within 12 hours of the injury. A knocked out baby tooth: Call us as soon as possible. Bleeding without any significant tears in tissue that could require stitches: Call us for instructions. When involved in high impact sports or vigorous activities, it is important to protect your mouth and teeth. This statement is backed by the fact that there are over 600,000 sports-related dental injuries treated in emergency rooms across the US each year according to the US Centers for Disease Control (CDC). In addition to absorbing and distributing the forces that impact the mouth, teeth, face and jaws an athlete receives while participating in sports such as baseball, football, basketball, hockey (ice and field), skateboarding and wrestling, the American Dental Association (ADA), also recommends the use of custom mouthguards for other activities such as acrobatics, bicycling, handball, racquetball, skiing, and even weightlifting. These facts make two things clear: (1) it is vital that you obtain a professionally made mouthguard that you wear during these types of activities and (2) that you also understand how this mouthguard protects you. Below are just a few ways. Lacerations. A custom-fit, professionally made mouthguard covers the sharp surfaces of the teeth to protect the soft tissues of the cheeks, lips, gums and tongue from lacerations that can occur from a blow or sudden jolt. Mouth Impact. Just as a mouthguard protects against soft tissue lacerations, it can also help prevent injuries to the jaws and teeth. This includes but is not limited to chipped teeth, fractured teeth, broken teeth and teeth that are partially or fully knocked out of their natural position. TMJ (jaw joint) Trauma. Wearing a properly fitted mouthguard can reduce the potential for jaw displacement and joint fractures by cushioning the jaws against damage from an impact. Direct Jaw Impact. Anytime a person receives a direct impact to his/her jaw, having a mouthguard in place may help prevent more serious injuries to teeth and jaws. This is especially important for anyone diagnosed with TMJ. Jaw Fracture. A custom-fit, professionally made mouthguard both absorbs and distributes impact forces so that jaws are protected. And it is this reduction in force that can help prevent the jaws from fractures. Under Chin Impact. Receiving a blow under the chin can obviously damage teeth; however, it can also cause damage to the jaws as well as inflame or cause TMJ issues. You can learn more about mouthguards by continuing to read the Dear Doctor magazine article “Athletic Mouthguards.” Or you can contact us today to schedule an appointment.